During July 2018 I will be participating on an artistic residency in Budapest. Supported by the Budapest Galéria, I will continue to follow a river on a project nammed: From Lisbon and Budapest or the Tagus and the Danube. Budapest Galéria is Budapest’s municipal structure of contemporary art: its activities include the installation of contemporary works in the public space, the organization of exhibitions at its premises in the heart of Budapest and the exchange of artists in residency. An exchange promoted by the Lisbon City Council under the Lisbon-Budapest protocol twin cities. 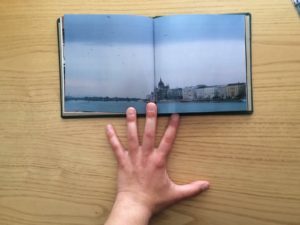 From the experience gained by photographing the Tagus and after the reading of the “Danube” by Claudio Magris, I propose to return to look and listen to the Danube. View of the edition “Journey to the Foreigner – Magyar Körztársaság or Hungary, 12 days of September 2008” created after a first trip to Hungary.